pride ourselves in is the quality of our work. 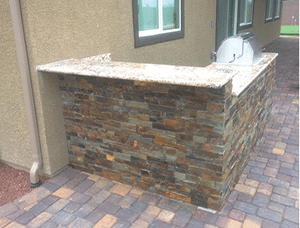 We strive to give you the best end product and one reason is that we use only the best materials available today. One of the things we use is real stone and tile. 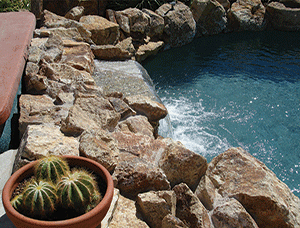 We use genuine stone materials to build landscapes, fire pits, outdoor kitchens, barbecues, and even waterfalls. 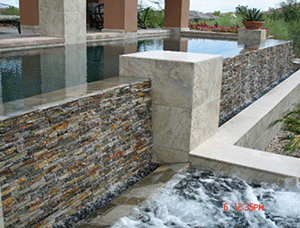 Aside from being beautiful, real stone has one other main advantage: durability. Stone is tough and can last a long time, so you don’t have to worry about problems with it in the coming years. Real stone and tiles look beautiful and can really enhance the look of any space. Imagine stepping into your backyard and being surrounded by natural stone, like in national parks, even if you’re living in the suburbs. We use a variety of natural materials, from granite to marble, to make sure you get the landscape you want. Our talented team of designers work with you, to find out what you want and what you are looking for. We then come up with designs to suit your needs and then once you approve, we execute it quickly and efficiently, so you can lounge around your pool or entertainment area sooner than later.